To verify the accuracy of IMRT administration, and in the absence of a single protocol, different procedures are implemented at each institution. Traditionally, these protocols are based on planar comparisons between the calculated and the measured dose in homogeneous phantoms evaluated using metrics such as the two-dimensional (2D) gamma function  (and nonconsensual acceptance criteria). Recent publications have reported no correlation between the results of this type of verification and their clinical implications, , and thus, more complete methods have begun to emerge based on patient anatomy, that use three-dimensional (3D) dose distributions and dose-volume histograms (DVHs) as new clinical IMRT evaluation tools. Certain studies propose the use of the dynalog files information to reconstruct these administered fluences based on the data collected during the treatment, and recalculate the plan based on the patient anatomy. ,, However, this method is not fully independent because it only obtains the positions of the leaves from the same encoders that are monitoring them, and thus, it must be validated for use. Moreover, this method does not verify the instantaneous output factor/fraction of monitor units (MU) ratio and fluence computation is dependent on accelerator modeling. 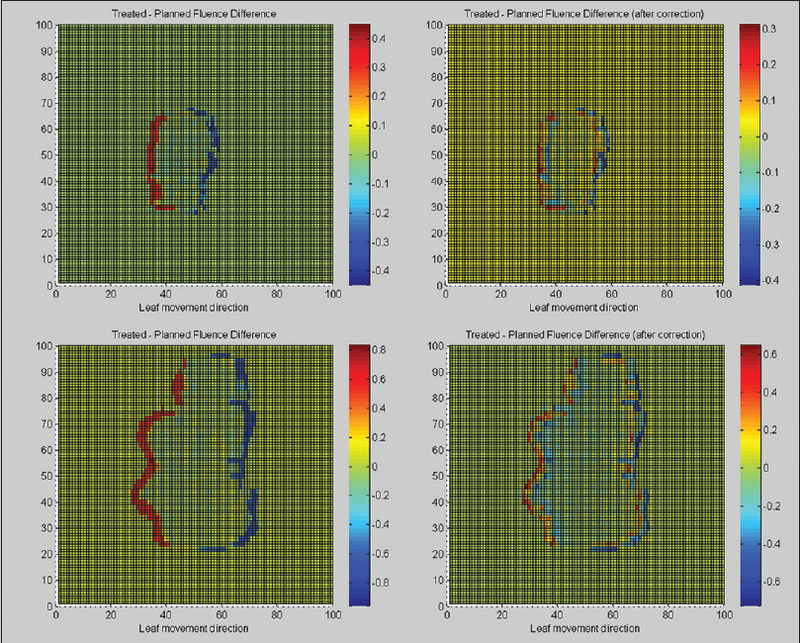 In this paper, we propose an original combined method to generate the administered fluences with an appropriate resolution for the subsequent dose calculation in the patient's CT based on planar detector array measurements while filling in the regions in which detectors are not present and within the detector area based on the actual positions of the leaves collected in the dynalog files during treatment. Additionally, this method will allow a mixed verification and validation of the information from these files and the detector array measurements. Ten patients were evaluated, corresponding to different clinical IMRT locations (prostate, gastric, head and neck, etc.). The treatment planning was performed using the Eclipse software version 10 (Varian Medical Systems, Palo Alto, USA) and the inverse optimization module "Eclipse Inverse Planning". The "optimal" fluence is obtained via optimization for each field. From this information, and taking into account the mechanical and dosimetry limitations of the MLC, the module "Varian Leaf Motion Calculator" (LMC) calculates the "actual" fluence for the subsequent determination of the dose and the MLC positions needed to administer it, depending on the MU fraction. These positions are stored in the dMLC file, which will be transferred to the MLC controller for treatment. Although all IMRT treatments are dynamic, every field is divided into a maximum of 320 segments in which the leaves are moved linearly. For planning purposes, we used a nominal energy of 6MV and the Anisotropic Analytical Algorithm (AAA) as the dose calculation algorithm. The administration of treatments was carried out in a Clinac 21EX (Varian Medical Systems, Palo Alto, CA) equipped with a Millenium MLC 120 (Varian Medical Systems, Palo Alto, CA). During testing, the procedure for obtaining the reconstructed fluence [Figure 1] was similar to the procedure used by the commercial systems 3DVH™ and COMPASS® A response (R dynalog-derived ) is derived from a previously known high-resolution fluence (Ydynalog-derived ), and this response is compared to 2D array measurements (R 2D Array ). This comparison allows correcting the previous fluence to account for treatment data (Yreconstructed ) before final dose determination. However, instead of using the planned fluence as this previous fluence, which completes the areas where there is no information from the array measurements without the information on the actual positions of the leaves during treatment, we used the administered fluence derived from the dynalog information. The detector matrix used in the measurements is the 2D-ARRAY Type 10024 Version 2 (PTW-Freigburg, Germany), consisting of 729 5 × 5 × 5 mm 3 ionization chambers, whose centers are spaced 10 mm apart in both directions. The ionization chambers are covered by a 5 mm polymethylmethacrylate (PMMA) plate. The array is centered at a water equivalent depth of 20 mm (7.8 mm build-up intrinsic effective point of measurement plus RW3® solid water (PTW-Freigburg, Germany) slabs) with 6 cm of RW3® solid water backscatter. The source to detector distance (SDD) is 1,000 mm. The array is calibrated using a cross-calibration method. A previous treatment planning system (TPS) calculated dose for a 10 × 10 cm 2 field is delivered, and the response of the central detector is used to determine the cross-calibration factor. This factor is applied to the entire matrix. All treatment fields were verified with a 0° gantry angle in the absence of an adapter for placing the detector array in the gantry head. The measurement matrix obtained (R 2D Array ) is reconstructed with an "artificial" resolution of 2.5 × 2.5 mm 2 , which is the same as the resolution used by the TPS to import or export the fluences. For this purpose, every 5 × 5 mm 2 ionization chamber area is divided into four pixels with the same value, which is equal to the measured dose. The pixels between ionization chambers are assigned a zero value. This process would be the same for each resolution needed. The integrity of the dynalog information, including both the fractional MU and the positions of the leaves, was verified by different methods in previous works and accurately represents the static-mode IMRT administration. , In dynamic-mode IMRT, the comparison with the detector measurements will serve to verify that information. Due to the large number of records included in the dynalog, they cannot be passed directly to a dMLC file due to its limitation on the number of segments (320), and thus, the treatment was constructed using the same number of segments as in the original dMLC. The positions of the leaves for each of these segments were obtained via the linear adjustment of the positions for the previous segment and for each registered MU fraction between the two segments, in the reverse of the process performed by the controller when generating the planned positions in the dynalog file. A computer program was developed in the Matlab language (Mathworks Inc, Natick, MA) to automate the process. This program reads the data stored in the dynalog during treatment and writes the dMLC files in the appropriate format for Eclipse TPS. To verify the correct performance of the algorithm, planned positions stored in dynalogs were used to reconstruct the planned dMLC file and leaf positions were compared with the originals from TPS with complete agreement. Once generated, the dMLC treatment files are imported into the TPS. From this information, the module LMC generates the dynalog-derived fluence (Ydynalog-derived ) for each beam. This calculation takes into account the transmission and the rounded edge of the leaves, but with a unique value for each parameter. With the obtained dynalog-derived fluence, the dose calculation on the phantom is also completed using the AAA calculation algorithm. To account for the finite size of each single chamber of the array, the TPS dose at the isocenter plane p(x, y) is exported and convolved with the lateral response function g(x,y) of the 2D array detectors, a 2D trapezoidal function 5 × 5 mm 2 wide at the top and 9 × 9 mm 2 wide at the base, as suggested by Poppe et al. , Once the dynalog-derived response p(x,y)*g (x, y) is determined, values at the single-chamber positions (x, y) are sampled (R dynalog-derived ) for comparison with the 2D array measurements. For practical subsequent calculations, the resolution is modified to match the resolution of 2.5 × 2.5 mm 2 , and the four pixels within the same detector take the same corresponding sampled value. The pixels between ionization chambers are assigned a zero value. High-resolution dynalog-derived fluences (2.5 × 2.5 mm 2 ) only include actual MLC positions versus fractional MU related data and need to be corrected with measurement data to account for other treatment administration dependencies. For that, a prior high-resolution (2.5 × 2.5 mm 2 ) matrix C is obtained by dividing the 2D-array response matrix values by the dynalog-derived response matrix values in the measurement position pixels (where the ionization chambers are positioned). This comparison estimates the difference between the two responses and allows us to determine the absence of alignment errors between the MLC and the detector and enables the verification of the MLC controller and dynalog information as well as any malfunction of the detector array. For all other pixels of this matrix C (outside ionization chambers), in the perpendicular direction, due to the leaf size, the information covers the total treatment region and the pixels take on the same value as the adjacent pixel in the ionization chamber position. In the direction of movement of the leaves where we have no information, we use a linear interpolation between the adjacent non-zero matrix C pixels. COMPASS® uses a unique value called the total scaling factor for all pixels out of chamber volume,  and 3DVH™ uses an unknown method inside the "smarterpolation". If planned fluence data are used, the values in matrix C could be high and could generate larger uncertainties in the scaling or interpolation processes, particularly when there are significant errors in the treatment administration. With treatment data, at chamber positions inside the fields, we have a normal distribution of discrepancies between measurement and dynalog-derived responses with a mean value close to 0% and a standard deviation 2σ < 2% [Table 1]. Thus, the pixel values where the ionization chambers are positioned in matrix C are mostly within ±2% (0.98-1.02), and uncertainties due to interpolation will be minimized. A small measurement depth, beyond the depth of the dose maximum, was chosen to minimize the error of this approach; equivalence between the response differences and fluence differences in a homogeneous phantom. A computer code was written in Matlab language to automate the entire procedure. Once the reconstructed fluence is obtained, it is imported into the TPS, and the dose is calculated over the phantom to verify that it corresponds to the 2D array measurements using gamma analysis to evaluate the accuracy of the implemented method. In this step, the reconstructed fluence is renormalized to achieve the measured dose at the isocenter. This procedure is necessary because the Eclipse TPS imports the reconstructed fluence as "optimal" and must modify it depending on the physical characteristics of the MLC to obtain the "actual" fluence, with which it performs the final dose calculation. After checking each field, the dose is recalculated on the patient CT and the 3D dose distribution differences and the DVHs are evaluated using the Eclipse TPS tools. In [Figure 2] (left), we compare the dynalog-derived fluence and the planned fluence. Differences close to 1% are observed in the treatment area, even in the case of optimal functioning of the MLC (all cases studied), and the differences in the edges of the field regions that have a greater influence on the histogram results are particularly important. The differences and locations are related to the effects of overdosing and underdosing due to a delay in controller sampling (which is a previously known occurrence) , and do not completely disappear after correction with the 2D array measurement results [[Figure 2] (right)]. 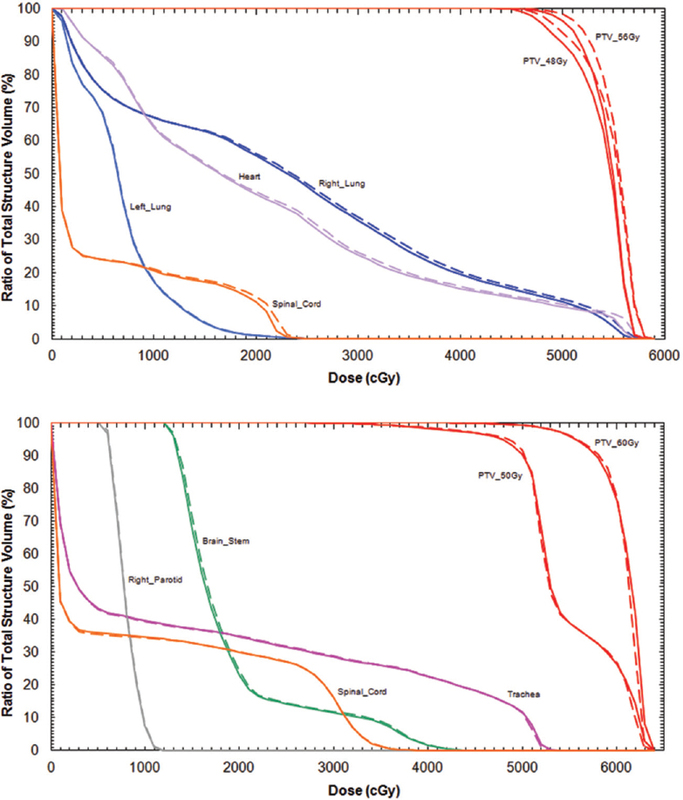 [Figure 3] shows comparisons between the measured and dynalog-derived responses, and the matrix C. The dynalog-derived responses include the actual MLC positions versus the fractional MU, but do not include second-order effects such as the instantaneous output factor of the accelerator or the effects of imperfect accelerator modeling by the TPS, including the modeling of the sources or the MLC (tongue and groove, etc.). These effects are taken into account by the experimental measurements. Once the reconstructed fluence is obtained, it is imported into the TPS, and the dose in the phantom is recalculated to normalize and validate it. [Figure 4] shows the comparison between the measured dose and the originally planned dose and between the measured dose and the reconstructed dose over the phantom for a given field. We observe that all measuring points pass the gamma test (2% in local dose, 2mm distance-to-agreement (DTA)), which would be fit their adaptation to the measures. Similar results are obtained within the field for each of the evaluated IMRT fields, showing the accuracy of the implemented method. Differences exist at points in certain fields outside the treatment zone. In that area, the reconstructed fluence is null, and the differences are due to discrepancies between the calculated transmission by the TPS and the measurement. This transmission is a single average parameter in the TPS; thus, its value cannot be optimized to the measurement conditions (field size, depth, and offset). Additionally, 2D array ionization chambers in this area are not under dosimetric reference conditions. 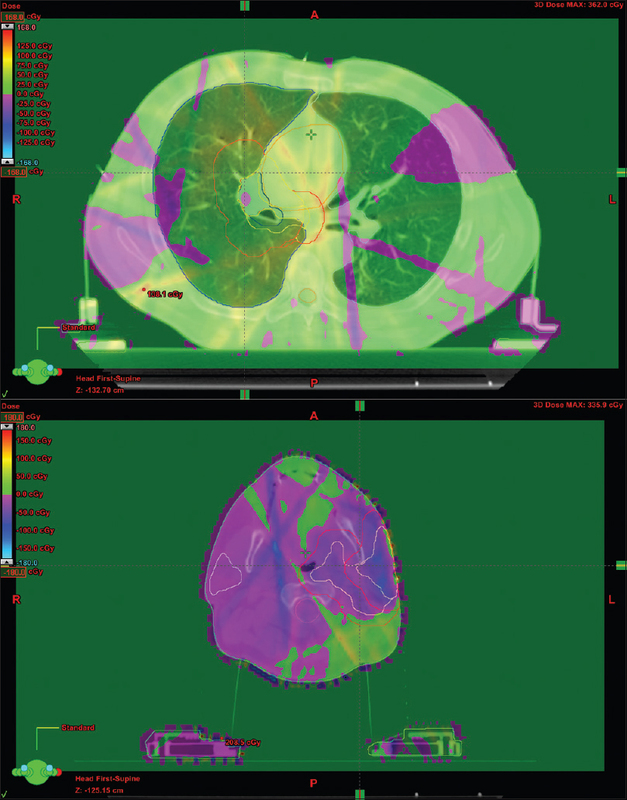 With the validated reconstructed fluence, the dose is recalculated over the patient CT. Initially, all phantom planar verifications meet the requirement that greater than 98% of the points pass the local gamma criteria of 3%-3mm such that treatments would initially be accepted. In [Figure 5], we observe the differences in dose (planned-treated) at the isocenter of the treatment. The differences within the treatment volume are less than 3%, and only two treatments show differences between 3 and 5% in certain points at the planning target volume (PTV) edges. The DTA metric in the gamma index may have masked these dose differences due to the high dose gradient of this area. [Figure 6] shows the differences between the DVHs of these two plans. In one plan, we observe sensitive differences for the PTV coverage and for the maximum doses in at-risk organs (up to 3.5%). A characteristic of all of the DVHs evaluated is the degradation of PTV homogeneity; however, the differences in the mean PTV dose remain less than 3%. Since the proposal of Renner et al. to use detector array measurements (EPID, diode array, ionization chamber array, etc.) to derive the administered fluence and recalculate the treatment on a patients anatomy, different commercial software packages have been appearing in the market. In the procedures of the COMPASS® and 3DVH TM software, the planned fluence is used as a pattern to improve the resolution of the 2D array measurements but without any type of information about the administration of the treatment. In [Figure 2], we show the differences between planned and dynalog-derived fluence and how these differences are not completely attenuated by correction with 2D array measurements, especially in pixels between ionization chambers, because with the detector size and density of the 2D array, the administered fluence cannot be fully determined. These systems are able to detect forced errors that affect various detectors of the matrix, as is the case for the output factor errors in static IMRT segments but not the multiple errors that can occur in regions without detectors due to the poor positioning of leaves in both static and dynamic modes. 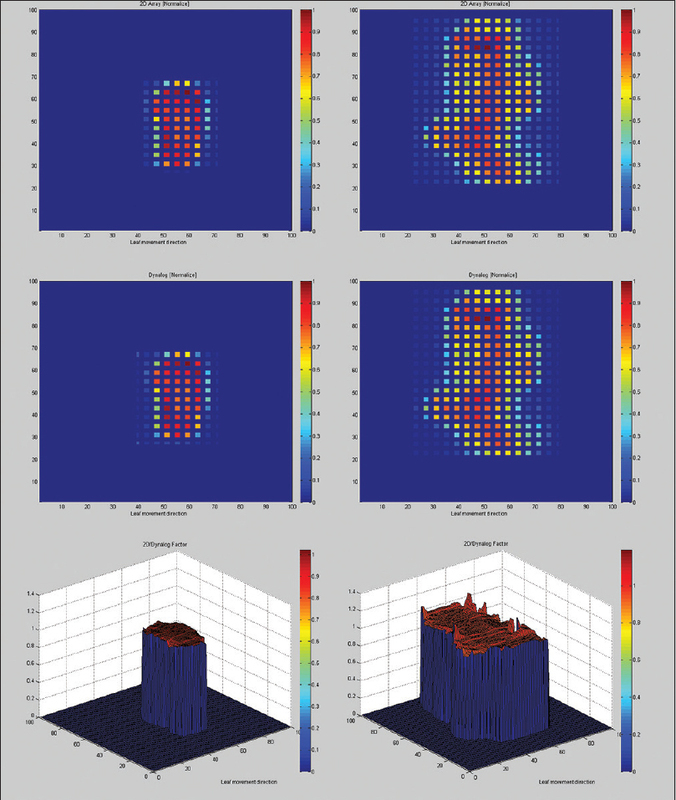 , In this work, we introduce the actual position of the leaves during treatment using dynalog information to fill all gaps between detectors and within the detector area, resolving the main drawback of these commercial software. Another issue of these systems is that errors in detector array measurements are moved throughout the improving resolution process. In the comparison between the dynalog-derived responses and the 2D array measurements within the treatment fields [[Table 1]], the majority of the differences are close to the uncertainty due to measurement inhomogeneity of 1% (2σ)  between ionization chambers, and all differences are below the total measurement uncertainty of approximately 5% (2σ). From here, it follows that both the 2D array measurement and the dynalog-derived response accurately represent the treatment within the field. However, differences greater than 5% occur in certain ionization chambers outside of the field or in penumbra areas that are not irradiated throughout their volumes and consequently, the measurements are not performed under dosimetric reference conditions. This trend affects the verification because it appears in regions with a high gradient between the edge of the PTV (coverage) and at-risk organs (maximum and high doses), and therefore, dosimetric errors would lead us to question a treatment that might be satisfactory. Indeed, in two comparisons between the planned and reconstructed doses for the patient CT, differences of up to 3-5% were found at certain points in these areas. Hence, the information contained in the dynalogs is useful in evaluating these measurements, and the use of the combined method allows us to locate these points, to evaluate why we have these differences and to correct them if necessary, for example, by assigning a value of 1 to each of these points in the quotient matrix C. We have chosen not to correct the value in the quotient matrix C in these cases to continue adjusting to the detector array measurement, as in commercial software. This issue appears in each of the commercial systems using detector array measurements to generate the administered fluence, even in those with high-resolution detectors as diode detectors due to their own associated dosimetric uncertainties (cumulative dose and temperature dependence, low energy over-response, etc.). Ionization chamber or diode detector dosimetric uncertainties have been studied in previous works, , but it would be desirable to perform further, more comprehensive evaluations of the influence of all of these dosimetric uncertainties on the results of recalculations over patients' CT in future papers, which is beyond the scope of the current study. A particular problem that arise when using these methods is that an incorrect calibration of the detector array could introduce systematic differences that affect all subsequent calculations and should be previously evaluated. In this paper, we used the same TPS and dose calculation algorithm as employed in the initial plan (as 3DVH TM , excluding uncertainties added by an additional "perturbation" algorithm), but the reconstructed fluence can be rebuilt using the right format and resolution for another algorithm, which would allow further verification of the TPS dose calculation. Nelms et al.,  show that many of the errors are due to the algorithm, especially due to the heterogeneities present in the patient, so this step would be highly recommendable. However, new TPS dose calculation algorithms such as AAA and Acuros XB® (Varian Medical Systems, Palo Alto, USA) or Monte Carlo methods are more accurate than those commonly used in their verification. Thus, for clinical evaluation, it may be convenient to separate errors deriving from fluence discrepancies, primarily due to treatment administration if a proper TPS commissioning was performed initially, from uncertainties due to final dose calculations that can be independently checked as performed at our institution. 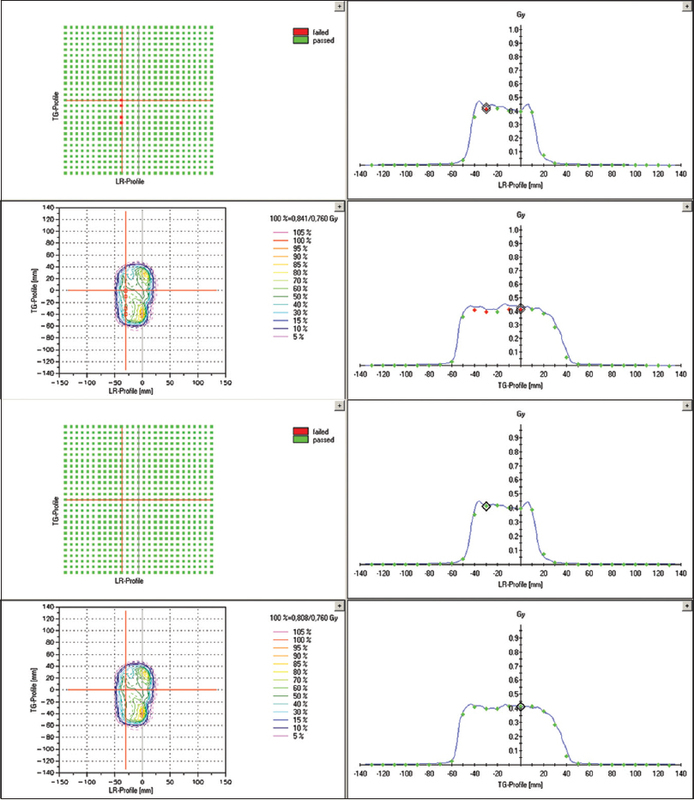 Commercial software packages have emerged in the market to convert low-resolution measurements obtained with a 2D detector array in fluence with the correct resolution for later use as a starting point for a dose calculation algorithm to obtain IMRT treatment verification in three dimensions on the patient's anatomy. However, the different approaches and corrections performed to improve the resolution of the fluence do not refer to the actual administration of the treatment. Our approach allows an increase in the fluence resolution using information on the treatment administration collected in dynalog files and improves on the accuracy of the methods previously implemented in commercial software. Detector array dosimetric errors may affect the results of the reconstruction in an important manner, such that measurements should be evaluated prior to use for patient-specific IMRT verification, especially in the penumbra of the fields. The method implemented is redundant and allows for verification of both the validity of the information collected by the dynalog files and the behavior of the detector array, thus enabling this previous evaluation. In addition, this method would be easily implementable by commercial developers or users. The dynalog-to-dMLC converter code is available via e-mail contact. Albert M, Broggi S, De Wagter C, Eichwurzel I, Engström P, Fiorino C, et al. Guidelines for the verification of IMRT. ESTRO booklet No 2008;9. Nelms BE, Simon JA. A survey on planar IMRT QA analysis. J Appl Clin Med Phys 2007;8:2448. Low DA, Harms WB, Mutia S, Purdy JA. A technique for the quantitative evaluation of dose distributions. Med Phys 1998;25:656-61. Carrasco P, Jornet N, Latorre A, Edualdo T, Ruiz A, Rivas M. 3D DVH-based metric analysis versus per-beam planar analysis in IMRT pretreatment verification. Med Phys 2012;39:5040-9. On the clinically relevant detector resolution and error detection capability of COMPASS 3D plan verification. IBA Dosimetry. White paper. 3DVH TM : On the accuracy of the planned dose perturbation algorithm. Sun Nuclear Corporation. White paper. Sadagopan R, Bencomo JA, Martin RL, Nilsson G, Matzen T, Balter PA. Characterization and clinical evaluation of a novel IMRT quality assurance system. J Appl Clin Med Phys 2009;10:2928. Dose reconstruction in the OCTAVIUS 4D phantom and in the patient without using dose information from the TPS. PTW-Freiburg. White paper. Litzenberg DW, Moran JM, Fraass BA. Verification of dynamic and segmental IMRT delivery by dynamic log file analysis. J Appl Clin Med Phys 2002;3:63-72. Luo W, Li J, Price RA Jr, Chen L, Yang J, Fan J, et al. Monte Carlo based IMRT dose verification using MLC log files and R/V outputs. Med Phys 2006;33:2557-64. Calama JA, Infante MA, Lavado ME. Implementation of a method for patient-specific IMRT verification using dynalogs files. Rev Fis Med 2011;12:209-14. Godart J, Korevaar EW, Visser R, Wauben DJ, Van't Veld AA. Reconstruction of high-resolution 3D dose from matrix measurements: Error detection capability of the COMPASS correction kernel method. Phys Med Biol 2011;56:5029-43. Varian User Manual, Dynalog File Viewer reference guide, September 2003. Poppe B, Djouguela A, Blechschmidt A, Willborn K, Rühmann A, Harder D. Spatial resolution of 2D ionization chamber arrays for IMRT dose verification: Single-detector size and sampling step width. Phys Med Biol 2007;52:2921-35. Li JS, Lin T, Chen L, Price RA Jr, Ma CM. Uncertainties in IMRT dosimetry. Med Phys 2010;37:2491-500. Li JG, Dempsey JF, Ding L, Liu C, Palta JR. Validation of dynamic MLC-controller log files using two-dimensional diode array. Med Phys 2003;30:799-805. Lossaso T, Chui CS, Ling CC. Comprehensive quality assurance for the delivery of intensity modulated radiotherapy with a multileaf collimator used in the dynamic mode. Med Phys 2001;28:2209-19. Sánchez-Doblado F, Hartmann GH, Pena J, Capote R, Paiusco M, Rhein B, et al. 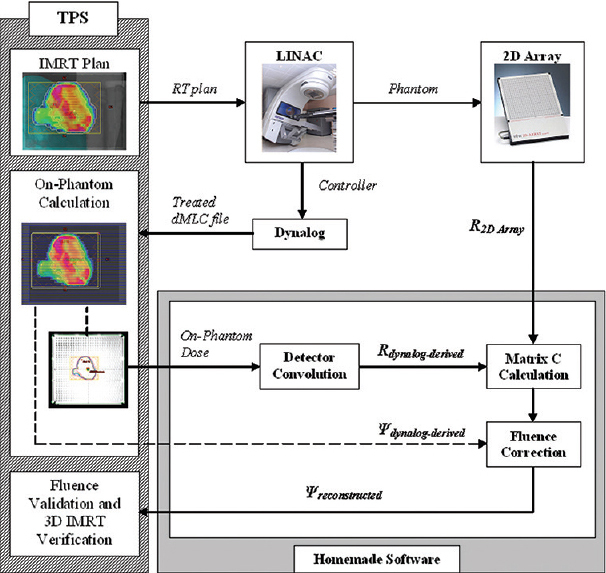 Uncertainty estimation in intensity-modulated radiotherapy absolute dosimetry verification. Int J Radiat Oncol Biol Phys 2007;68:301-10. Renner WD, Sarfaraz M, Earl MA, Yu CX. A dose delivery verification method for conventional and intensity-modulated radiation therapy using measured field fluence distributions. Med Phys 2003;30:2996-3005. Boggula R, Lorenz F, Mueller L, Birkner M, Wertz H, Stieler F, et al. Experimental validation of a commercial 3D dose verification system for intensity-modulated arc therapies. Phys. Med Biol 2010;55:5619-33. Bouchard H, Seuntjens J. Ionization chamber-based reference dosimetry of intensity modulated radiation beams. Med Phys 2004;31:2454-65.